From morning ‘til night, our bodies are exposed to a variety of chemical toxins. This may be difficult to believe, but if you take a closer look, you will be alarmed at what you find. Chemical toxins are everywhere, from body soaps and moisturizers, to shaving creams, shampoos, and even the toothpaste we use. Your morning cereal may be exposing you to pesticides, and the milk is probably laced with hormones. If this sounds shocking, it ought to be as the human body is bombarded with toxins every minute of every day, possibly contributing to more health problems than we have yet realized. “Detox” means cleansing, referring to the removal of toxic substances from the body. The body has its own beautifully assembled detoxification system, of course, to protect and perfect our physiological functioning. The problem is that in today’s world there are over 100,000 chemicals registered with the EPA, very few of which our bodily detox system was built to handle. Toxins therefore accumulate. Case in point: an infamous analysis of newborn infants’ umbilical cords found that they contained over 200 toxic chemicals. Many of the toxins were carcinogenic and considered neurotoxins. So this is really the basis of why people look to detox and to cleanse: to reduce the body’s “toxic load.” The problem is that most detoxification programs really don’t accomplish much, while others actually may be harmful. The human body has four main excretory pathways that remove environmental toxins as well as toxic products produced by the body. These include the feces, urine, sweat, and breath. Although some toxins are directly eliminated by some of these pathways, many toxins need to be transformed into water-soluble compounds in order to be eliminated, while still others have to be changed into complex molecules. This transformation occurs in the body’s most important detoxification organ, the liver. When we think of scientific detoxification we are really referring to ingredients that can help the liver package up harmful toxins in the gastrointestinal (GI) tract and eliminate them through the bowel. This system works incredibly well – in a normal environment. But today, the extremely high levels of environmental contaminants entering our bodies can overburden our built-in detoxification system in the liver. The toxins remain and accumulate to sometimes dangerously high levels, causing a host of health issues. For most people, detox means fasting, sweating, drinking lemon juice and honey, and using laxatives. Although these practices may have some benefits, they fall short of what needs to be done to help the liver. They also may be dangerous, and here’s how. Remember, the liver needs to “re-package” toxins to move them out of the body. It’s like sending a gift to a friend. You need to wrap it, box it, and put an address label on it to get it to its destination. Toxins are similar; they need to be packaged up in the body and then shipped out. But their passage includes a trip through the gastrointestinal (GI) tract, and that’s where things can get complicated. If the gut doesn’t properly participate in the process, detox isn’t compete. Without dietary fiber, for example, the “repackaging” of the toxins doesn’t occur (or not very well). Here’s how it works, or doesn’t. Bile carries the liver-treated toxins – everything from dead blood cells to pesticide waste – to the gallbladder and into the intestine, where bile is useful in absorbing fats to produce stool. But if there isn’t sufficient dietary fiber in the gut, elimination stalls and toxins can be reabsorbed into the body. The result is damaging chemicals entering the bloodstream, where they can cause a lot of potential harm. Another issue that can cause toxins to be reabsorbed instead of eliminated is gut flora – bad bacteria outnumbering good bacteria in the intestines. Healthy food is indeed the foundation of good health, but only if we can properly digest it and eliminate any toxins found within it. That’s why I’m happy to share information on how to include more fermented foods in our diet without having to learn to love pickles and sauerkraut. Look no further than the Whole Earth & Sea brand. 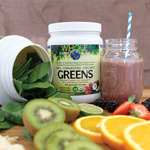 Whole Earth & Sea 100% Fermented Organic Greens is a shake line that comes premixed and ready to drink in delicious flavors such as chocolate, tropical, and unflavored. Each serving contains: fermented organic fruit, vegetable and grass blend (made of alfalfa, carrots, barley grass, apples, blueberries, cranberries, broccoli, cabbage, arugula, cauliflower, red radish, upland cress, watercress, wheat grass, kale, parsley, spinach, tomatoes, beets, peppers, Swish chard, spearmint, celery, basil, artichokes, black radish, cilantro, dandelion, organic spirulina, and organic acerola cherry extract). A nice brunch or luncheon salad.